Triple layers of Zebra Print and Polka Dots all rolled into one. The bottom layer is a 1.5" grosgrain zebra print, the middle is a 7/8" black grosgrain ribbon, the top layer is a 5/8" red with white polka dots grosgrain ribbon. 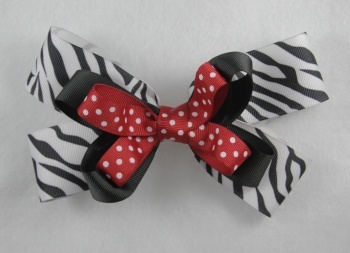 Zebra Lovers will go crazy for this bow. Black, white and red is such a great combination. There is 72" of ribbon wrapped with the polka dots into one great bow on a French clip.